Accomplished writer Jane Yolen applies the same magic she used to turn her classic picture book, Owl Moon, from a simple story about a child and her father going out to look for owls into a magical poetic journey. In Take Joy, Yolen creates a craft book that inspires the reader to see the charm and adventure of writing. Yolen, a prolific writer of novels, picture books, and essays, sees writing as a joyful activity, rather than a struggle. While I do at times struggle with my writing, the more I read Yolen’s comforting, optimistic ideas, the more I got excited about my own work. Yolen’s writing advice is not a Mary Sunshine take on writing. She is well aware that all is not rosy in the writing world, but she also delights in creating stories and worlds. The more I read about her approach to writing, the more I relished my own writing time. Yolen combines her enchanting slant on writing with an organized, common sense structure. There is a chapter on each aspect of writing. I especially liked the chapters on gathering ideas, researching a topic, choosing a point of view, and dealing with rejection. She combines specific, concrete advice on each of these subjects with her own special blend of inspiration, and gave me lots of new ideas on how to approach my own projects. 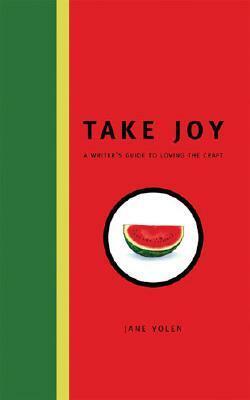 There’s no eBook version of Take Joy— my favorite way to read books—so I had to order a paperback copy through Amazon. This made me realize that I expect to receive a book instantly now that eBooks exist. The added wait was well worth it though. Now I have a paper copy full of penciled underlines to pick up and read anytime I need writing inspiration. I loved the cute cabins we stayed in. In my ideal fantasy life I'd have my own cabin (and so would each of my friends and family) and then we see each other several times a day in the main building for classes and meals! Inside my cabin. There are 2 beds but I had the cabin to myself. It was wonderful having a cabin to myself and having my laptop and Internet. Home is where my laptop and Internet are! * Cheryl Klein, an executive editor at Scholastic, gave an excellent hour-long crash course on how to revise your novel. Her blog and plot checklist will give you a good start on revising. Now I want to read her book on revision because the hour went too fast for me. * Katherine Erskine's speech on how to focus on writing was full of concrete ways to nurture creativity and make sure that turns into actual writing. * Jennifer Laughran was my favorite agent to speak at the conference. Not only does she know the book world inside and out, she's funny too, and sharp, and she has her own blog. *I got to meet and talk to my regional advisers –Edie Hemingway and Lois Szymanski– and was struck by not only how truly kind both of them are, but also how much writing and publishing experience they each have. *I went to the extra evening LGBTQ session as a spur of the moment decision and was glad I went. It was a refreshingly fun and honest session, full of: good writing information, friendly people, and a list of new books I now want to read. * I was surprised how much I liked Cassandra Clare's speech about forbidden love and how to create satisfying love triangles. It was partly because she used shows like: Buffy, The Vampire Diaries, and Felicity as examples, but I also liked her speech because she made a lot of good points. Clare explained that to have a real love triangle, as opposed to a love "V", all three parties have to have a relationship and connection with each other. She used the TV show, Felicity, as an example of a love "V" because the two guys Felicity likes– Ben and Noel– have no real relationship or connection to each other. Her example of a true love triangle was from the TV show, The Vampire Diaries. The fact that Damon and Stefan are brothers makes their love triangle with Elena all the more interesting because the audience cares about their relationship as much as they care about Elena and Stefan or Elena and Damon. After Clare's speech, the SCBWI Co-President Lin Oliver pointed out that if you are writing Middle Grade fiction, you can use Clare's points on love triangles by exchanging the word love or romance for friendship. It’s allergy season, the time of year when I go from being reasonably a disciplined person and instead become an excuse machine. This allergy season the article, 5 Steps to Developing a Healthy Relationship with Food, keeps whispering to me. "Why is it so hard to stick to a healthy eating plan and a reasonable exercise regimen?" "From the viewpoint of Cognitive-Behavioral Therapy (CBT), the reason isn’t hard to find: knowing what to do and knowing how to get yourself to do it are entirely separate skills. When it comes to changing behavior, especially long-term, habitual patterns, getting yourself to do something different, even when you know it’s good for you, depends largely on what you tell yourself: that is, on your thinking." What kind of thinking leads to overeating? "let’s say you’re at a dessert party and see five really delicious pastries. Will you end up eating too much? You probably will if you think, I don’t care. I don’t want to deprive myself. It isn’t fair that everyone else gets to eat whatever they want, and I have to settle for one small piece. By contrast, if you say to yourself, "I’m going to pick my favorite dessert. I’ll eat one small piece slowly and enjoy every bite. I know I’m going to feel so proud of myself," you stand a much better chance of not overeating." The article explains in step-by step detail how first changing your own thinking patterns helps you to make lasting changes. It’s worth reading the whole piece. Allergy season is so hard. I feel horrible and can’t think. I should give myself a break and watch an episode of The Vampire Diaries instead of writing my own story. After all, the writers of that show are excellent at plotting, so watching an episode is sort of like studying plot, which is almost the same as writing, so watching an episode should totally count as writing. Right? Watching 5 episodes is probably five times as good. Okay, I"m convinced. Is it bad that the fact that this type of thinking seems a lot like Damon compelling someone with his amusing vampire powers makes the excuses appeal to me even more? Conclusion: CBT is a lot like Vervain and can totally protect you from vampires who are trying to get you to overeat or convince you not to write. PS – I’ll be writing a review of seasons 1 & 2 of The Vampire Diaries as soon as season 2 is complete. See, I’m writing a review. I’m practically cured already. PPS – The last couple days have actually been really good allergy-wise, which made writing this post and avoiding episode 2.19 of The Vampire Diaries much easier. "I’m not asking you to dye your hair red and call me Mulder, I would simply ask that you consider the possibility that Marie had knowledge of, or had contact with something up there." The Carnival of Lost Souls: A Handcuff Kid Novel, by Laura Quimby (****)  After years of searching, foster child Jack Carr and his social worker Mildred think they may have finally found him a home. An elderly professor specifically asked for a child who likes magic tricks. Handcuff-collecting, Houdini-loving Jack fits that description perfectly. Jack’s new home with the professor and his doting housekeeper, Concheta, is a dream come true until the Professor dares Jack not to peek into an old carnival chest in his office. Of course, Jack has to peek. It’s too late that he realizes he’s been tricked into taking on the professor’s debt, a deal the professor made long ago when he was just a boy. Now Jack’s soul belongs to the great Mussini. As Jack is pulled into the land of the dead, the professor urges Jack to use his love of Houdini to help him get free. Jack’s skill of escaping from handcuffs helps him in his new role, entertaining the dead in one of the acts of Mussini’s traveling carnival. Could Jack’s skills also help him escape and return to the land of the living? That’s the trick Jack needs to figure out. The Carnival of Lost Souls is an entertaining tale. Quimby creates an intriguing land of the dead where life seems much like the days when there were traveling carnivals with seedy edges, a group of lovable kids, and creepy surprises along the way. 1. Help them save and safely store their work. 2. Help them find a time and place for writing. 3. Help them find a writing community. I stopped feeling guilty about my blog reading addiction and decided instead to put it to use posting a list of monthly links I like. 1. Genre-Bending– Laurie Halse Anderson (who wrote Speak and other YA and MG books) explains how she’s able to write and sell books in more than one genre. 2. Cold Hard Facts About the Writing Life– Anderson links to this excellent post she wrote this summer that answers the question all writers want to know: Can I live off my writing? 3. Late Bloomers– A reassuring article from the New Yorker on artists who were late bloomers. I read about it on the Verla Kay discussion boards. 4. Has the Newbery Lost Its Way? – Anita Silver’s Newbery question started a flurry of online discussion. My favorite responses are Liz B’s, The Newbery Means What?, and Fairrosa’s, The Recent Newbery Debate. 5. Cybils– Liz B. also has a question-answer post on the two-year old Cybil Awards—a cyber children’s book award that packs in more fun than the Newbery. 6. Promotion Gold in Them Thar Links– Laura Purdie Salas and Fiona Bayrock post a helpful list of book promotion idea links on their new micro site, Bubble Stampede! 7. A Nice Gal’s Guide to Online News and Politics– I started this blog in September to make my addiction to reading progressive political blogs useful too. This is my favorite post, so far: 5 Progressive Sites for Busy People. Reading about Twyla Tharp’s work habits, successes, and failures was reassuring and inspiring for me. If creating is difficult for even the most successful artists, then suddenly hard work seems meaningful and do-able.